Wild whales Vancouver, Vancouver, British Columbia. Information, Photos and Reviews. 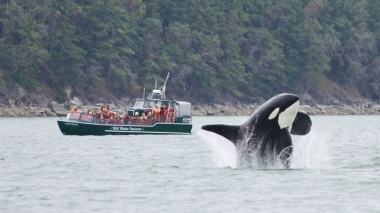 Explore the waters off the coast of British Columbia on this whale watching tour to see killer whales, humpbacks, seals, sea lions, porpoises, marine birds and more. A marine naturalist will guide your tour helping to point out areas of interest and provide tips for seeing wildlife. Your journey will offer you unparalleled views of downtown Vancouver as you maneuver along the Strait of Georgia and beyond in your search for coastal wildlife. Your tour begins on historic Granville Island, where you will check-in. You will head out onto the water in your vessel, and your marine naturalist will explain how to spot wildlife and will point out species and areas of particular interest. Feel free to ask questions at any time. During your tour you may see killer whales, humpbacks, seals, sea lions, porpoises, marine birds and more in their natural environment. Your guide will explain their behaviours in real-time. We guarantee you'll see a whale on your tour, your next trip is free! Your vessel follows all Pacific Whale Watchers Association (PWWA) guidelines to ensure minimal impact on the species observed. Conservation is a focus and a portion of your fare is donated directly to local marine conservation initiatives. Killer whales are iconic the the Pacific Northwest. This whale breaches next to our open vessel in a majestic acrobatic display. Nobody has reviewed Wild whales Vancouver yet, Be the first. You are submitting a booking enquiry. Wild whales Vancouver will then contact you by email with details of availability and prices.